My name is 192.168.159.16 is a metaphorical visualization of nowadays-human beings. In my point of view we are not bounded to one body anymore. We are extended through networks to infinity. The location does not matter, what matters is connection. Thus, at this point I totally agree with Mitchell “disconnection would be amputation. I link therefore, I am.” We are becoming gradually fully equipped and totally dependent on technology cyberorgs. The installation consists of 4 dolls in each a speaker inside, 4 relays, arduino, a computer, and a modem. We are using Processing, TTS (text to speech), and Arduino. The independent and at the same time isolated network is created. IP addresses are continuously renewed and sent to a random doll. 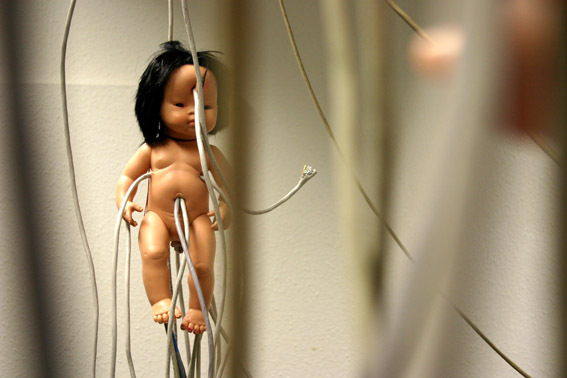 Thus only one doll is speaking at a time (4 speakers are controlled by 4 relays through arduino). – White Night Skopje 2010 (Skopje, Macedonia). – received a jury prize for media art installation at 23rd Stuttgarter Filmwinter!